I’ve written before that when life changes, your organizing systems often need to change right along with it. If you’ve ever suddenly discovered that a space you previously organized and used well for years suddenly didn’t work for you anymore, then you likely know what I’m talking about. Growing out of your organizing systems can happen anywhere in your home. For example, your kids’ rooms may need to change when their interests change; the kitchen may need to be reorganized if you overhauled your cooking and eating habits; and your creative space will need to change when your approach to crafting changes. That last one is a biggie! Creative people often have lots of outlets for their creativity. Perhaps you can relate to this? For a while you were into beading. Then, it was paper-based scrapbooking, which ultimately evolved to Project Life or maybe digital scrapbooking. Or, perhaps you made collages for a while, but then gave them up for knitting. If you’re feeling uninspired or even overwhelmed right now, take heart that you’re not alone, and remember that it’s okay to give up the remnants of past creative pursuits. It’s perfectly acceptable to donate unused supplies and give up on partially completed projects. Yes, you heard me right. I’m giving you permission to donate perfectly good craft supplies and stop working on (and worrying about) projects that no longer bring you joy. When you clear your creative clutter, you’ll create breathing room in your craft space. You’ll feel free and inspired to do the creative work you love. Get started today! 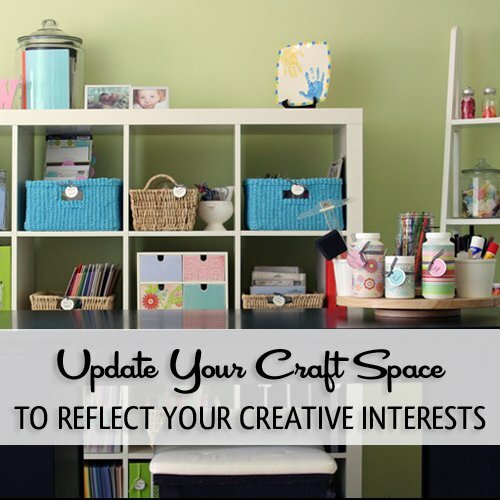 Take fifteen minutes and clear out some old craft supplies or unfinished projects. Simply grab a bag and collect a few easy items – perhaps the oldest ones or the hobby you gave up longest ago – and donate your castoffs to a local school, daycare center or retirement center. Then, enjoy the freedom of less creative clutter and more inspiration. I helped my parents clear a lot of fabric by donating to a sewing/quilting circle at church. They really appreciated it.